A Toolbox Talk is an informal safety meeting that focuses on safety topics related to the specific job such as workplace hazards and safe work practices. This form is used to record toolbox talks that have happened in the site. From your project page, go to Risk Management tab > Create on Toolbox Talk tile. From your navigation bar, go to Risk Management > Toolbox Talk. 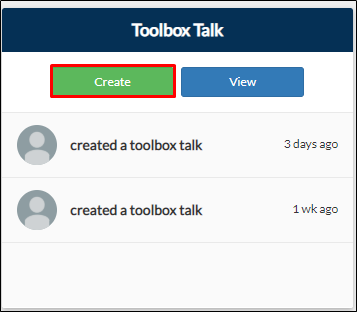 Or type in 'Toolbox Talk' on the search bar located in the upper right corner of your portal. 2. Select a project name. Note: Field will only appear if you created it outside your project. Project Address will also be filled out once there is a selected project. 3. Fill out all necessary fields especially the Toolbox Talk Meeting attendees. Note: Click Clear Signature to clear the field. You may also Add or Delete rows.